Jonathan Petty, UK Sales Manager for Patagonia Apparel, took the time to chat with SGB about what makes the brand special, and its environmental aspirations. SGB: Can you tell us some of the history of the company? Jonathan Petty: As a clothing company we’ve been around since 1972. 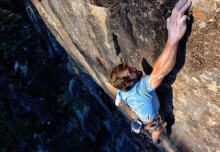 We are are owned by a chap called a Yvon Chouinard, a climber who developed the clothing line as there were no clothes suited specifically to climbing; most climbers were wearing rugby tops and jeans as they were hard wearing! Initially Yvon imported rugby tops and then eventually he started making his own. At that time Yvon was climbing a lot in Patagonia hence that was the new name for the clothing company. The logo is of Mount Fitzroy in Patagonia. The range built from the rugby shirts to technical clothing as he was climbing in colder climates in Patagonia. Fleece were developed when Yvon started working with Malden Mills who invented ‘plow’ which is now known as fleece. This was designed with easycare qualities as it dried very quickly and was as warm as a woolen jumper. SGB: Where is the company today? JP: Our fundamental mission statement is to make the best product and to cause no unnecessary harm to the environment. So we make all outdoor clothing and we target primarily climbers and mountaineers. We also make products for skiing, travel and surf. Our aim is that the product will last a long time, we are a complete opposite to the fashion world and the big manufacturers. In terms of the environment, we are aware that everything is polluting so although we are using polyester and nylon, Yvon actually started using recycled polyester for the fleece in 1996, which was ahead of the game. So we use recycled plastic bottles and other sources and our goal by 2010 is to either be using all recycled fibres, when using polyester or nylon, or natural fibre like organic cotton. And we would like for people to be able to bring them back when they are worn out so we can recycle our own garments too. The company wants to be fully responsible for the full product lifecycle to minimize the harm done to the environment. Over half our spring range, 65 per cent, contains what we call ‘e’ fibres and 40 per cent is already recyclable. That will increases again for next winter and then we’ll get to our goal of being fully recycled. We call that our common thread recycling program. We are trying to get our people to work with us to be environmentally friendly. We look at our manufacture and our distribution. On the website we show five products which we then break down the environmental impact by breaking down the miles they’ve travelled etc. for the CO2 impact. We are transparent in what we are doing so people can be educated and informed and then make a choice based on that. SGB: Does that have a positive impact on sales and brand perception? JP: Yes, our customers vote with their feet. We have brand loyalty and we have very good dealers too as they support what we are doing and give us feedback. For them, it is a sales tool for them to stock Patagonia. From a marketing perspective it is a point of difference. Historically we have not pushed the fact that we are environmentally friendly but we have always been the best quality. It’s only in the last 18 months we have been really pushing our green credentials though the catalogue, website and through our staff. SGB: How do you assess the environmental impact of the brand? JP: We have an environmental team whose job is to audit what we do, and fabric technologists and designers that look at the impact of the fibres so that is how the decisions were reached to use the recyclable fibres. Within this we also looked at the whole impact of moving to recyclable fibres including things like the VAT that is omitted and how much energy is used. Also we have looked at the dyes we use and tried to use the least toxic. We investigate all the alternatives and make an assessment on what is the most sustainable. For example, we could use bamboo to make clothing as this is a natural fibre but we don’t because there is a lot of very toxic substances used to process it to make cloth. The same is true of corn. There is no actual benefit to the environment. There is no-one guiding us, we are out on our own making our own decisions to try our best for the environment. SGB: What are the key products for the apparel side of the brand? JP: The main product we have launched this year is the Shelter Stone jacket, this is a three layer and is the only jacket on the market that is made from recycled nylon. Nylon is hard to find recycled, and it’s hard to then recycle the products made from the recycled nylon but we have resolved that issue and our coat can be recycled. That is our vector piece. On a generic level we are trying to promote our ‘common thread recycling program’ and one of the key products there is our Capilene base layer. This is our sub-brand and is made in recycled polyester with an odour management treatment on it. The product isn’t new for us as we’ve been making base layers for 20 years but we have updated the fabric with odor management and we are asking people to bring them back when they’ve finished wearing them for recycling. We can also actually do that for any Polartec fleece from any manufacturer. Our retailers are given a cardboard recycling bin which people can then use to bring their garments into the shop for recycling. You might worry about the CO2 used to send the garment back but we have looked at this and the amount of CO2 used to send it back and recycled is 71% less energy and 72% less CO2. We have even looked at the difference in sending by sea or lorry. The ships are far more efficient than the lorries or air freight. In the long term we want to be sustainable and still be around in 100 years time so making product from oil will be made as efficient as possible. SGB: Is the recycling done in the UK? JP: Partly in Japan, partly in America. They strip off the zips and melt the garments down extruding PT pellets and then make new fibre. There isn’t a manufacturer in the UK that does this at the present time but I can’t see why we couldn’t have a factory doing this as they are enough recyclable products out there. America and Japan have mills which have over the years recognised the changes needed and have converted with our encouragement. We have also encouraged our cotton suppliers to go organic. SGB: What’s your key message to the independent, as a brand? JP: We thrive on the key independent shops because you do have to tell the story to the customers. Independents could do very well with Patagonia and it amazes me that some still stock the same brands as the multiples. At this stage it is a really good opportunity for independents to promote themselves as green which the big boys don’t. If they look at brands that can make a difference to the environment I think that is a key way for them to survive in a tough market. The big guys are getting bigger so you have to look for ways to differentiate yourself. Nigel Holmes, European Sales and Marketing Manager for Patagonia Footwear, talks to SGB – Sports and Outdoor about why customers should buy the brand, and how they’re perceived. SGB:What’s the perception of Patagonia footwear? How do you influence it, and how do you want it to be seen? Nigel Holmes: Well, Patagonia footwear is made under license by Wolverine, which also owns Merrell and Caterpillar, and also Hush Puppies. In terms of the Patagonia brand we work closely with the clothing side and all the PR and testing is done for both clothing and shoes. At the Keswick mountain festival in May, which is for film and outdoor pursuits promoting the area, we will work in conjunction with the clothing guys there and are sponsoring one of the walks. We also give out clothing and shoes for people to test, soon our stand we look for and pass on leads for accounts to clothing and to the European head office in Annecy. The thing about the Keswick festival is that we can get shoes on feet in the outdoor eviroment, so it’s promotional and to heighten brand awareness as we have a great range of footwear and clothing. We want to market the recycled content of the footwear, the environmental aspects of the brand. We are all passionate about the environment. It’s great to work with a brand that’s in tune with our lives and is the bedrock on which the brand was founded. In fact, the environmental message from Patagonia has leaked into Wolverine headquarters in Rockford, Michigan which has adopted a lot of the procedures of the Patagonia brand. It’s a very interesting knock on effect that the brand has had; we are looking at a lot of different manufacturing methods. SGB: So why should a first-time customer buy Patagonia? NH: Well, there’s the environmental issue, plus the shoes being fantastically comfortable and using great materials. For example, we use cork foot beds with a recycled content. We use leather from ISO 1401 tanneries which have very strict environmental standards in terms of the way they dispose of their waste. By buying our footwear there is a big knock-on in supporting a brand that is working towards protecting the environment. We also have a great range outdoor walking boots and trail shoes which really do perform in that environment. Also we have fantastically soft leather footwear, flip flops and beach wear. All the products do what they say on the box. SGB: How much of your sales rely on multiples as opposed to independents? NH: We have a nice balance of both multiple and independent retailers. We work with Schu and Sole Trader in terms of high street multiples and we also work with Blacks and Cotswold in the outdoor sector. We are evolving the independent retail base – you have to remember this only our third season as we started last summer; retailers are always very nervous in taking on new brands. They like to dip their toe in to see how it goes. SGB: What kind of retail merchandising do you offer? NH: We’ve produced a number of show cards to explain the product and to show the consumer. These are on recycled card using vegetable inks. We also have tower units and three shelf units which are really good quality. SGB: What message do you want to give the customer or retailer? NH: I want the consumer to seek out the brand for the environmental positives as footwear historically has been a big polluter. If you buy Patagonia you are supporting a more environmentally aware way of manufacturing shoes hopefully that will have a wider effect on the industry. Our mission statement is to build the best product doing no unnecessary harm, to use business to build and inspire necessary solutions in the environmental crisis. To educate the retailer we do staff training and explain the manufacturing and material we use.